We’ve put a twist on a traditional French recipe by swapping tuna for hot-smoked salmon in this alternative but equally delicious salad nicoise. Bring a medium saucepan of water to a simmer, then gently lower in the eggs and cook for 6 minutes for soft-boiled. Drain and run under cold water to stop them cooking more. Carefully peel, then cut in half and set aside. Heat a griddle or frying pan over a medium heat. Toss the broccoli in a drizzle of oil and griddle, turning, for 4-5 minutes until charred and just tender. Transfer to a large mixing bowl and toss together with the lentils, chopped olives and parsley. In a small bowl, whisk together the 5 tbsp olive oil, dijon mustard, sherry vinegar and shallot with a pinch of salt and pepper. Add half the dressing to the lentils and broccoli, mix well and spread out on a serving platter. 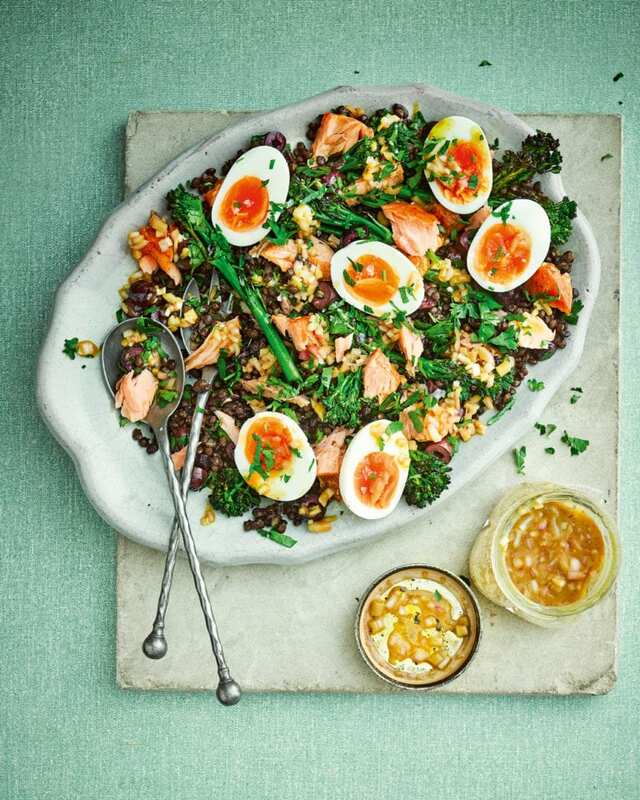 Flake the salmon and arrange over the lentils along with the halved eggs. Drizzle over the remaining dressing and serve.